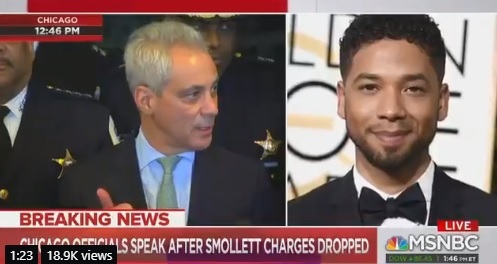 Despite the evidence against Jussie Smollett the Cook County State’s Attorney dropped ALL 16 CHARGES against Smollett on Tuesday! This afternoon even Chicago Mayor Rahm Emanuel condemned the Cook County Attorney’s decision to release Smollett. “This is a whitewash of justice,” Emanuel said Tuesday afternoon during a fiery press conference alongside Chicago police superintendent Eddie Johnson. “A grand jury could not have been clearer.” In a stunning reversal, all charges were dropped against Smollett Tuesday morning by the Cook County State’s Attorney’s Office.